It’s been an entire week since I visited Chai Ki and I honestly haven’t stopped thinking about my experience at their restaurant. My bestest friend Miss S and I seldom visit Indian restaurants. We’re both South Asian (albeit different countries), for us curry is something that we can always eat at home so why would you go out to eat something that isn’t as authentic as a home cooked meal? Still, as I often loiter around Canary Wharf shopping centre, I was intrigued by Chai Ki. 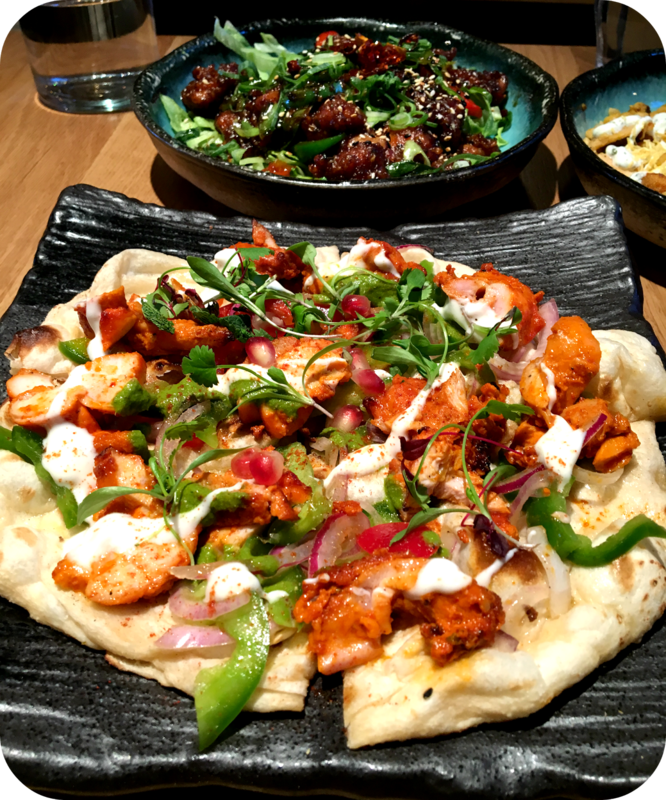 Located in Crossrail Place, the newest addition to Canary Wharf’s shopping malls, Chai Ki sits alongside some brilliant new restaurants. I always thought that it looks quite understated from the outside but still very intriguing all the same. Miss S and I had a quick look at the menu outside and thought why the heck not, and walked right in. The decor was not that of a typical Indian restaurant in any way. It’s up market, classy even but you would never be able tell the kind of cuisine they did if you had to guess just by the decor. I liked it! Who says Indian restaurants have to be all sitars and Bollywood posters, right? Since neither of us fancied a curry, we clarified whether it would be OK for us to have just the starters and nibbles. The waiter very kindly said of course it was OK and let us choose where we wanted to sit. The restaurant has a considerably large bar area and some tables along one side. I didn’t get a chance to see upstairs, where I’m assuming were bigger tables. We were one of the first people in the restaurant so we picked one of the tables along the side. As the restaurant got busier, I realised that the tables are actually a bit too close for comfort. At one point it felt like we were on the same table as the bickering couple next to us. Awkz. The menu has a great variety of dishes and I was told that the chicken and meat is halal which was even better for us. Since we weren’t feeling curry, I was glad that even their “bar plates and nibbles” menu was extensive. 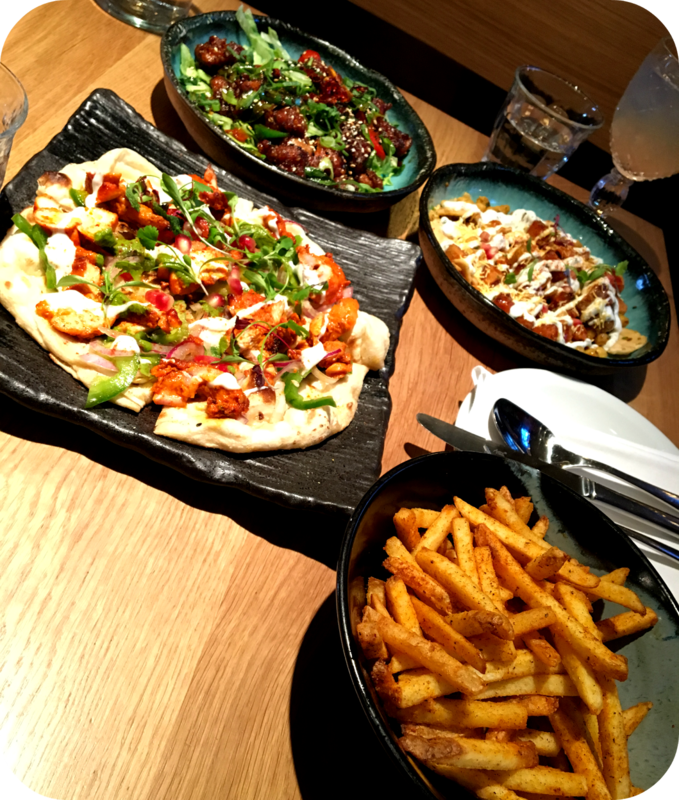 We decided to opt for 4 different things, Masala Fries, naan, Burnt Chilli Chicken, Chicken Tikka Naan and Shakakandi Chaat. Whilst we were chatting away waiting for our food, I showed off my brand new camera to Miss S. The lovely waiter then came over and asked if we’d like him to take our picture for us. Considering we were expecting them to say please could you refrain from taking any photos, this was a really nice surprise. The food came promptly and it was presented beautifully. The colours of all the dishes were dancing around on the plates ready to be devoured. My favourite of the lot was the burnt chilli chicken. 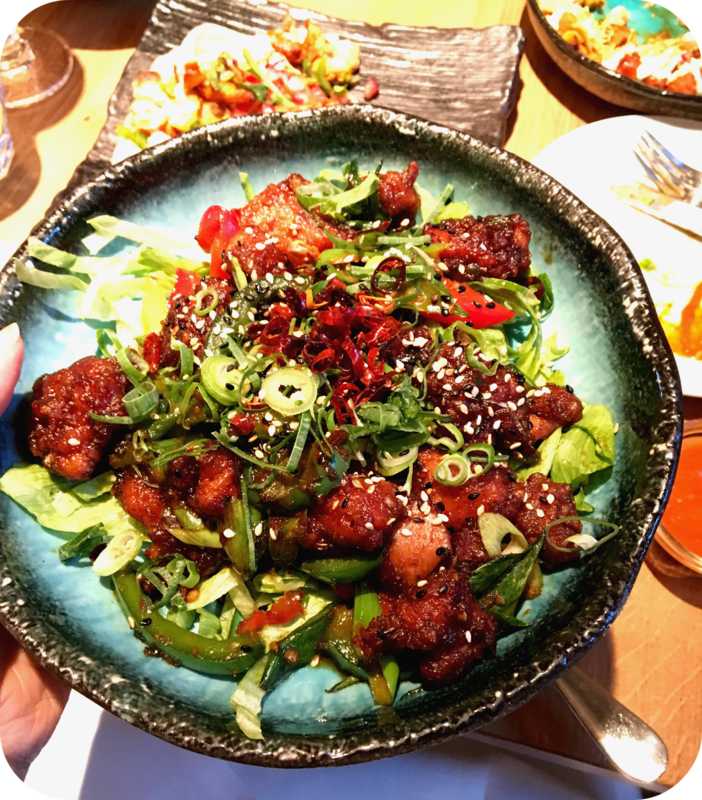 The sweet and spicy flavours of the dish contrasted with the greens tastes so so good and I haven’t stopped thinking about it since! I did notice that the restaurant didn’t provide any sauces, which is strange for an Indian restaurant. We asked for a chilli sauce and were given one that was so so spicy but tasted so good. I’ve only just checked out their menu and it was Agni ‘fire’ sauce which if you’re Asian it’s naga chilli! By the end of it, our noses were running and mouth’s were on fire but what’s a good Indian if you’re don’t leave the place without wanted to down a million gallons of water and questioning whether there’s enough loo roll at home. The service was beyond what I expected. The waiters were so friendly, and kept an eye on all the tables without hovering and standing on our heads. As soon as your glass was empty they’d top it up again. It was some of the best service I’ve had in a really long time. All in all Chai Ki have now earned the top spot for my favourite Indian restaurant. The food, ambience and service exceeded my expectations by a million miles. If you’re in the area, it’s a definite must-visit and if you’re not then you need to be making a trip!